Jun 10th. A first visit from Sound Tradition. A first visit from Sound Tradition who hail from the East of England. 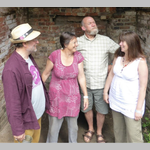 They are Linda Baddley, David Bartlett, Catherine Legge and Moose and I know many of you are already familiar with the group because of their appearances at our local festival at Alcester. For the rest of you expect some lovely arrangements of some fine traditional songs with harmonies that are gathering praise up and down the country. Don’t worry all you joiner inners you will have plenty of opportunity to participate.